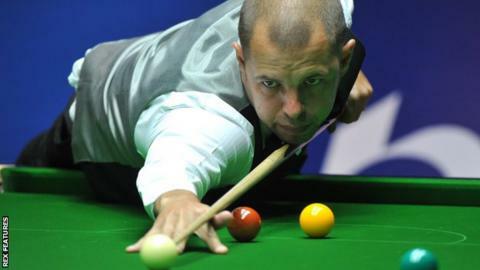 Barry Hawkins said the tables at York's Barbican should be burned as he joined the list of players to criticise the conditions at the UK Championship. Stephen Maguire has said the tables were "not good enough", while Ding Junhui was furious with the multiple table set-up after his first-round defeat against Adam Duffy. World number eight Hawkins lost 6-3 to Robin Hull in the second round. "The conditions were just unplayable," Hawkins told BBC Sport. "It was a load of old rubbish performance-wise, but I had no confidence in the table. I think we should set fire to the lot of them to be honest." World Snooker says atmospheric conditions will affect the way the tables play and that it is aware of players' concerns and is looking into ways to address the situation, including new cloth. And London-born, Kent-based Hawkins was in total agreement with the Scot. "I didn't want to use the cushion or roll balls along the cushion," he said. "I was getting kicks every shot. It's so disappointing because they normally play nice here. "We never used to have tables playing like this and they are getting worse, so I don't know what's happened." The 2013 World Championship finalist added: "I am glad lots of other people have said the same as me so it doesn't look like sour grapes. I am just saying it like it is. I didn't enjoy that whatsoever. "I don't know what the answer is. I don't know why they play so bad because they used to play lovely all the time. "There must be a reason why they keep bouncing off the cushions like they are and the kicks are ridiculous."